CCUS 2014: Taking your Ultrasound Game to another level! Montreal may 9-11, 2014! 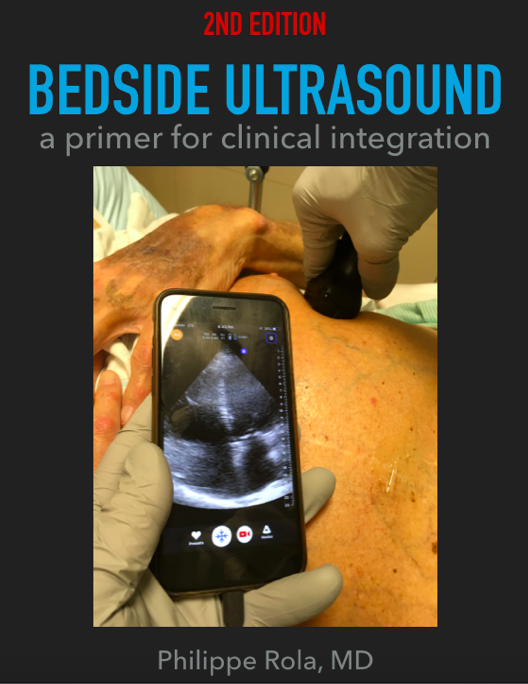 Indeed, this isn’t “just” a “how-to” course – although that is what we’ll be covering in the workshops which will follow each lecture – but a “how to integrate ultrasound into your daily practice” course, so no matter what your level is, you’ll find something suited for you. The workshops will be divided into novice and experienced and with a low participant to faculty ratio, will ensure a great experience. 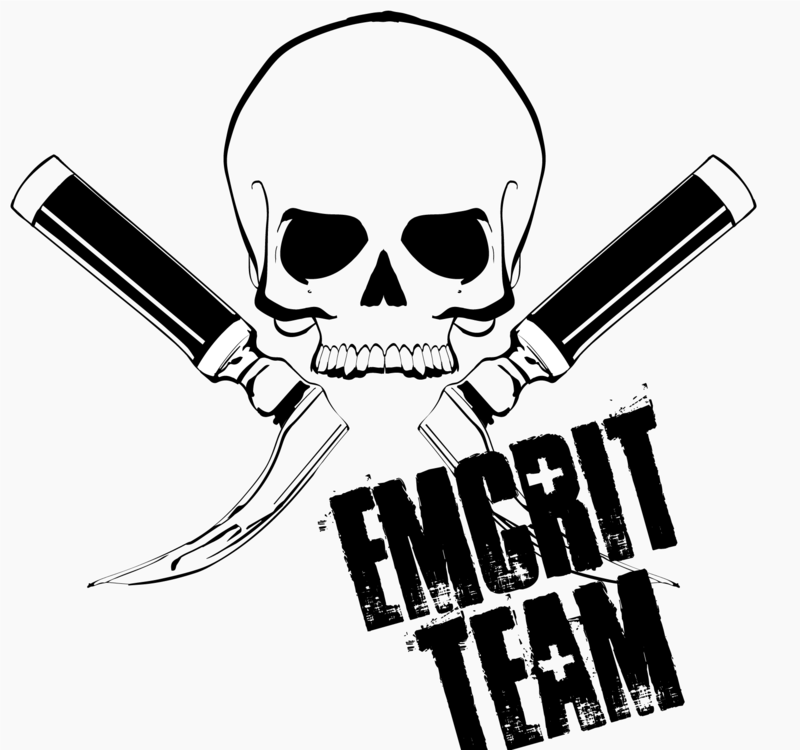 For those of you part of the twitterverse and #FOAMed movement, you’ll get a chance to meet @criticalcarenow (Haney), @bedsidesono (Mike), @nobleultrasound (Vicki), @EGLS_JFandMax (JF and Max) and @ThinkingCC (yours truly)…and Matt (pulmccm.org) will be there to chronicle the event and bring the highlights to the #FOAMed world. 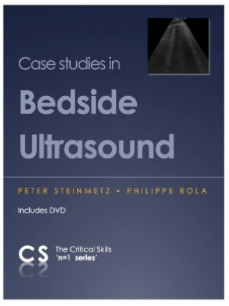 As I said a few months ago – well, tweeted, to be exact – if you’re an acute care MD and NOT using bedside point-of-care ultrasound, you’re stuck in the 20th century… rude, but true. So I just finished listening to the second podcast of The Resuscitationists’ Awesome Guide to Everything (www.ragepodcast.com), and as advertised, it is totally awesome. It’s really cool to have the point of view of several bright acute care clinicians whose field of expertise obviously overlaps but have different perspective in terms of experience and setting. In episode 2, they do a great review of the MOPETT trial and thrombolysis in PE in general, and really work at distilling clinical information from academic literature, which is ultimately what has to be done. The hashing out of the finer points by using specific clinical scenarios is really, really good. I have personally applied the MOPETT half dose TPA twice with good success, both in young patients and after explaining the risks and benefits. As in full dose thrombolysis, the clinical improvements in minutes to hours of massive/submassive PEs are quite remarkable. So much kudos and everyone interested enough to read this should most definitely be checking them out, I know I’ll be! S1P (sphingosine-1-phosphate) is a regulator of endothelial permeability and immune function. Uh-oh, why had I not heard of it? Hmmm…I don’t think it was in Guyton’s or in Harrison’s…and there hasn’t been an RCT about it… Ok, that about explains it. – serum levels correlate with HCT as RBCs serve as an S1P reservoir. – anemic patients’ S1P levels are NOT fully replenished by transfusion, especially the older the transfused blood is. – In fact, older RBCs may actually remove plasma S1P. They basically took mice, and in the first group, bled them (by 20ml/kg) and looked at inflammatory markers, lung permeability and also S1P levels. That’s basically the control group, and they noted that hemorrhage significantly increased inflammatory markers (interesting in and of itself) . They then transfused these mice using wither fresh, S1P-loaded RBCs, or 14-day old RBCs, and, lo and behold, the fresh blood resulted in less inflammation, increased S1P, but most importantly, markedly decreased lung permeability. So clearly, S1P attenuates transfusion associated lung permeability. In the next group, they injected the mice with LPS following hemorrhage, and found a synergistic effect of blood loss and LPS on inflammation and lung permeability, as could be imagined. Following the LPS, they were transfused with one of four strategies: fresh blood, old blood, fresh blood + S1P or old blood + S1P. Well, lung permeability still increased in all groups, but least in the fresh blood + S1P, and the old blood + S1P a close second. So here we’re looking at the finer effects of transfusion, and why, against “common-sense” correcting a patient’s hemoglobin level does not seem to help in all situations. We have understood the aging issue and loss of deformability, but it is time to take a finer look. 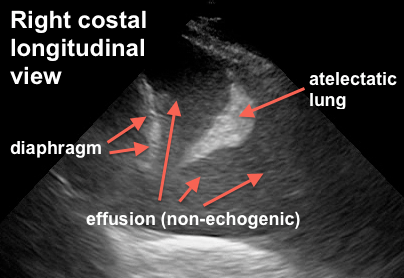 We are familiar – at least in concept – with transfusion-associated lung injury or TRALI, but the mechanism remains unclear. I’ll add what I can dig up on human S1P studies soon. So here is the clip again. 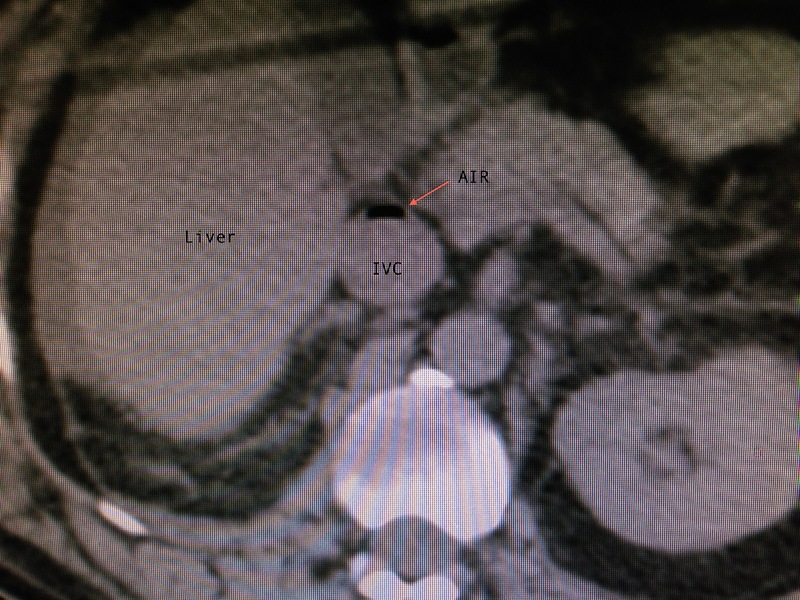 This is a transverse epigastric view with the IVC in short axis and the hepatic veins (bunny ears) draining into it. We can see bright hyperechoic material moving up and down, which are air bubbles. Note that this is air in the hepatic veins and NOT the portal veins, which can be “relatively” common due to ischemic bowel and a few unusual causes. Air in the systemic hepatic circulation is quite unusual. Obviously, air anywhere in the circulation implies a breach of vascular integrity somewhere – in the case of portal venous air, the breach is in the bowel microvasculature as the bowel breaks down. In the case of air in the hepatic veins, we are looking at air coming from (a) the lower body vasculature, so in the absence of trauma the most likely cause is iatrogenic from a femoral line, or (b) the upper body vasculature if associated with tricuspid regurgitation (iatrogenic or lung vascular injury coupled with positive pressure ventilation). Here is an article discussing hepatic vein air. Their clinical point is important to note – you have to investigate to get an idea of the amount of air and the possible source. So this patient was transferred to my ICU from a smaller centre for more aggressive care. He was in profound septic shock felt to be pulmonary in aetiology, on levo/vaso/epi and dobutamine, ventilated on 100% with PEEP 16. 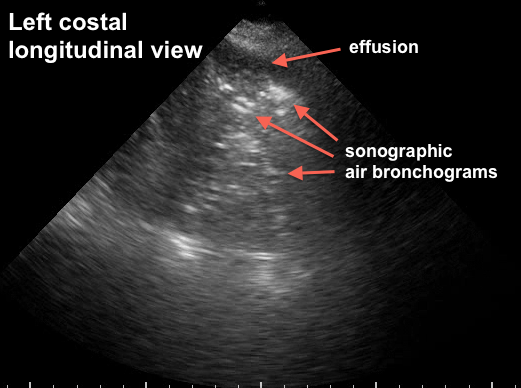 My basic CUSE (critical ultrasound examination) done on essentially every critical care patient revealed this rapidly and, concerned that air embolism had occurred (femoral line was in situ at arrival), I scanned him. 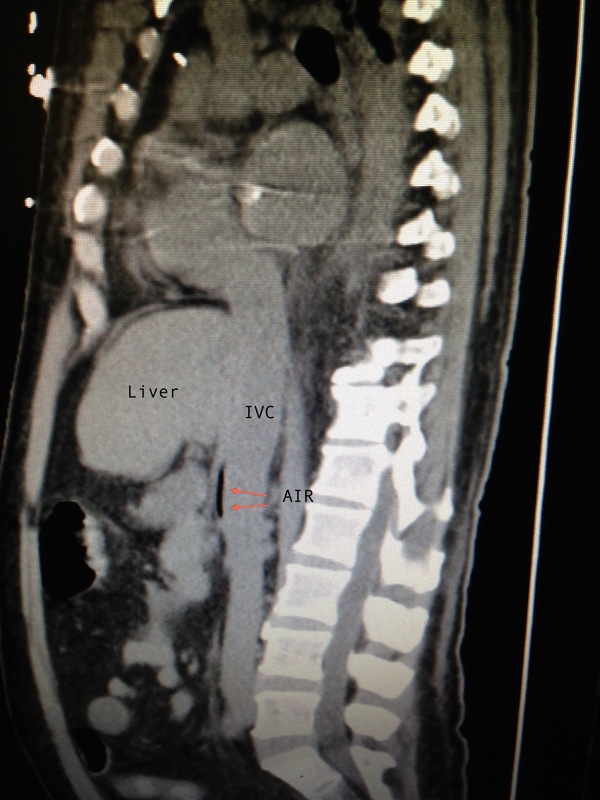 You can see a small sliver of air in the IVC, and none was noted in the liver or in the heart (which was what I wanted to r/o). Now of course ultrasound is much more sensitive than CT for identifying small air bubbles (a CT image is a composite of several slices so a small bubble is lost) but when he returned form CT and I scanned him again, the hepatic veins no longer had air, but the IVC was full of air below the liver (as in the CT), so I think moving the patient had relocated the air. More to come on the clinical story and investigations of this particular case, which is still ongoing. What should I be thinking of? Answers tomorrow. Lets see what you guys come up with! rubbadoc says: What’s air doing there? A great surprise this morning: a comment from John. Yup, THE John. So taking a page out of Scott’s book, I thought it would be worth sharing with everyone as its own post, as opposed to just a comment. I think this is must-read material for everyone. “I thought I might add some quirky ideas to your discussion. We are now getting familiar with the concept of endothelial cells covered by a surface glycocalyx layer, that forms part of the barrier and mechano-sensing functions of the blood-tissue interface. We have discussed in some detail, the role of the glycocalyx in preserving endothelial integrity. I am gonna try and add a bit more spice into the whole transfusion drama. In recent times, we have started talking a lot about a bioactive phospholipid called sphingosine-1-phosphate (S1P), as a crucial element in preserving vascular barrier integrity by ‘protecting’ the Glycolcalyx. (Most geeky papers on TRALI and other transfusion related complications do mention it). Because albumin is one of the primary carriers of sphingosine-1-phosphate (S1P), it is possible that S1P, acting via S1P1 receptors, plays the primary role in stabilizing the endothelial glycocalyx. Infact, antagonism of S1P1 receptors have been shown to cause widespread shedding of the glycocalyx, as evidenced by increased serum concentrations of Heparan sulphate and Chondroitin sulphate. (This might probably be one of the mechanisms how albumin is glycocalyx friendly). RBC transfusions are a double edged sword…..especially in situations of acute anemia as in post hemorrhagic situations ( major GI bleed or trauma. )….I totally agree with you in that the two are conceptually very similar. Erythrocytes have been identified as an important buffer for sphingosine-1-phosphate . In mice, depletion of plasma S1P by genetic inactivation of S1P synthesizing enzymes (sphingosine kinases 1 and 2) elicits profound pulmonary vascular leak, which can be reversed by restoring circulating S1P via RBC transfusion. In humans, hematocrit (Hct) predicts plasma S1P levels. There also seems to be a dynamic equlibrium between SIP levels of the plasma, and the circulating RBCs. It has been demonstrated that in anemic individuals, plasma S1P levels are not uniformly restored by RBC transfusion. Rather, the age of the RBC unit at the time of transfusion tended to negatively correlate with the ability of RBC transfusion to replenish plasma S1P. During storage, the S1P content of human RBC markedly declines, likely due to enzymatic degradation. Because erythrocytes serve as a buffer for circulating S1P, aged RBC with low S1P content may be incapable of restoring plasma S1P levels and may actually remove S1P from plasma, which in turn could contribute to increased endothelial permeability, capillary leak, and infiltration of inflammatory cells. I hope this partly answers your question as to how the glycocalyx may be impacted by inappropriate and irresponsible transfusion triggers. I agree that these are all very novel ideas and as such, exist in the realm of experimental clinical physiology, but my gut tells me that the delicate Glycocalyx may hold the clue to a lot of answers to questions that have plagued us for a long long time! So first of all, thank you very, very much for reading and taking the time to comment and enlighten us. As John says, this is still in the realm of experimental physiology, but I think there are a lot of situations we are faced with, perhaps grey zone areas where we debate two potential therapeutic avenues, where we can use some of this data. We might debate giving that extra bit of fluid, or debate crystalloid vs albumin, or blood or no blood with an Hb of exactly 70, and I think we have to start weighing in some of this physiological data, even if it isn’t “evidence-based-by-RTC” to help guide these decisions. Mystery John has an uncanny ability to describe complex physiology in the simplest way possible. I am very interested in digging more into his predictions of the possibility of aged erythrocytes removing S1P from circulating plasma. Dr. John, if you’re out there, could you point us all to some of these studies you’ve mentioned? Any good S1P review papers you’d recommend to those, like me, who are S1P novices? Thanks for your input! It was a pleasure. Thank you Derek, for the kind comments…. I think the concept of S1P is still in the process of evolving and assuming a definitive shape, so a good review might be hard to stumble across. — Anping Dong et al. 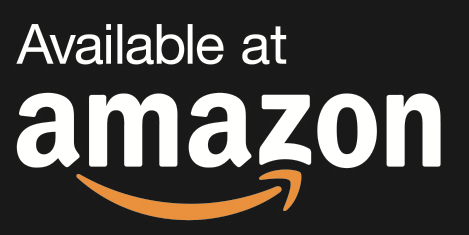 (It is open access at http://dx.doi.org/10.1155/2012/924042).